Don’t be surprised if you haven’t heard of this driver that cost more than my first car. Honma marketing is almost nil in the U.S. But the Japanese sure know about this bellwether company that has been around for many years. According to Travel & Leisure magazine, the Japanese appreciate Honma golf clubs in the same way they admire a well-manicured Bonsai tree. One of the biggest attractions is the shaft. The shafts are handmade. When it comes to performance, these shafts are among the best on the market. The star grades (from 2 to 5) measure the quality of carbon used in each shaft. Higher grade carbon contains more glass than rubber. This allows the shaft to bounce back quicker to its original form. Thus, you lose less built-up energy, and guess where that energy ends up? You got it -- it’s delivered to the back of your golf ball. This MG713 has a 4-star rating. That’s 4 out of 5 for those of you that are skimming through this and missed it the first time. 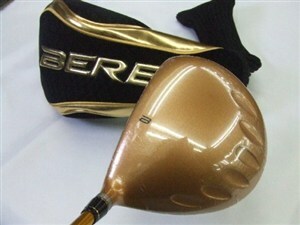 The club has the highest MOI possible and the largest top surface face of all of Honma’s clubs. Six bazooka ribs help transfer more energy to the ball, and there are low ridges on the shallow face to make the trajectory of the ball fly higher.